Home Clothing Culture England Mod Music Review Style UK 'Faces in The Crowd' an Emma-Rosa Dias Afro-Mic Production. 'Faces in The Crowd' an Emma-Rosa Dias Afro-Mic Production. 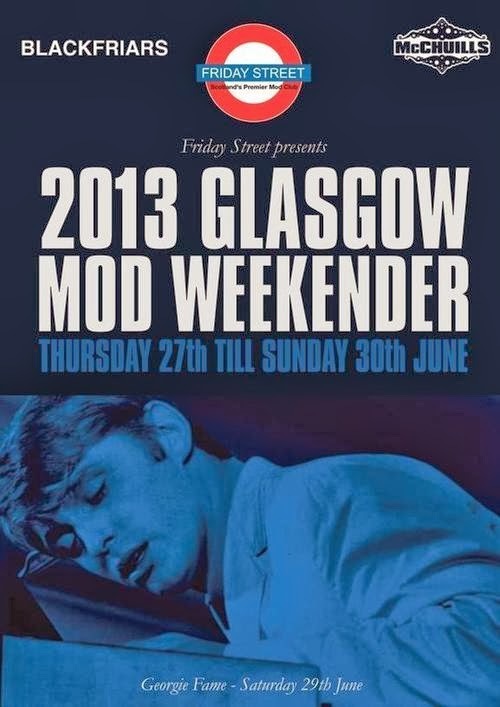 Say 'Glasgow Mod Weekender' to the majority of people, and even if they're not connected with the scene they'll know what you're talking about. This weekend is infamous for cool tunes, threads and of course cool people. 2013 saw Emma-Rosa Dias take us to the heart of the weekender getting up close and personal with some of the weekends most well known faces. This short film is a real insight into what makes the weekender special, it gives you a real idea to what the weekender is all about. Emma has a chat with some real influential people on the scene, including Paul 'Smiler' Anderson who is releasing a book called, 'Mods The New Religion The Style and Music of the 1960's Mods' and Peter Ballantyne an original 1960's mod still on the Glasgow scene today! The production of this film is superb and it puts you in place as if you've bought a ticket for the weekender. It captures the mod ethos perfectly, moving forward but always looking back. It's amazing to see the wide scope of people at the weekender, all looking equally sharp and tuned in. The creative arts come to the fore here, with scooter builders, designers and bands making appearances and having a chat with Emma. This weekender is one of the major mod events on the calendar along with the Brighton weekender, so it's great to be able to get an access all areas pass and see what goes down. The soundtrack to the film is superb, original 60's RnB is all around with some original SKA too. It's great to see weekenders like this being documented as the people who can't get there (like myself) are right in on the action from the very start. Mod has evolved and developed, but still keeps it's original roots and this is clear to see here. Many of the people Emma speaks with mention the Revival era and the Britpop era and how they came about the scene. It's fantastic to see the amount of people mod has touched and how it continually keeps growing. This film is a real tribute to mod and it's current identity within the modern world. I believe mod will always be here, as long as there's guys and girls with good taste! This is echoed throughout this film and it makes me smile. So Faces in the Crowd is definitely one to pick up, it really shows off our wonderful sub-culture to a tee. It gives me great pleasure to say it gets an easy 11/10 and is an all round great piece of work. Check Emma-Rosa Dias out on http://www.afromicproductions.com/.